Barcelona, Spain – The ability to generate spoken verbs in infinitive in a given time begins to worsen in the early stages of Alzheimer's disease (AD). Thus, the verb fluency test has been found to be a suitable neuropsychological tool for the detection of healthy aging people at risk of developing cognitive impairment, according to a recent research of the Research Center and Memory Clinic, Fundació ACE, Institut Català de Neurociències Aplicades, UIC-Barcelona, Spain (fundacioace.com). The study reports a large single-site clinical cohort of 568 cognitively healthy (CH), 885 mild cognitive impairment (MCI) and 367 mild AD dementia individuals, undertaken and led by Fundació ACE Research Center and Memory Clinic. For the purpose of the study, they were administered the verb fluency test, apart from the neurological and neuropsychological assessments as part of the diagnostic procedure. Longitudinal analyses were performed in 231 CH and 667 MCI subjects to search for verb fluency predictors of diagnosis conversion. All individuals were older than 44 years old, had an educational level of at least elementary school (that is, at least 6 years of formal education) to ensure the correct understanding of the verb fluency test, had completed the verb fluency test and had been administered the Neuropsychological Battery from Fundació ACE (NBACE) (Alegret et al., 2012), their DNA was available, and had completed the diagnostic procedure with a baseline final diagnosis of CH, MCI or mild AD dementia. Most of previous research with verbal fluency used category and letter fluency tasks (which demand generating names) to assess their subjects, not verb fluency. Since generating verbs is more cognitively demanding than generating names and verb fluency has been less commonly used than category and letter fluencies, Alegret et al. raised the hypothesis that “verb fluency task might be a suitable tool to detect subtle performance deficits in patients with MCI and mild dementia who otherwise perform normally on other cognitive tests,” says Dr. Montserrat Alegret, Neuropsychology Chief of Fundació ACE. 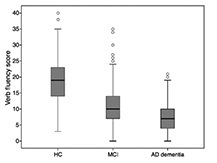 The results of this study, published in the Journal of Alzheimer’s Disease, showed a worsening on verb fluency performance from CH, MCI to AD dementia groups. Moreover, worse scores in verb fluency task were significantly related to conversion from CH to MCI, and from MCI to dementia. When the effect of time to conversion was analyzed, a significant effect of verb fluency was found on the faster conversion from CH to MCI, but not from MCI to dementia. Finally, verb fluency cut-off scores and sensitivity/specificity values were calculated for age and/or education groups for use in identifying individuals with cognitive impairment. The most recent studies about AD are focused on the detection of its preclinical stage. The results of this study reveal that verb fluency test may be a useful tool for the differential diagnosis of cognitive failure in the elderly. Verb fluency test provide a useful gradation of impairment from normal aging to MCI and mild AD. Moreover, it is a suitable neuropsychological tool for the detection of healthy aging people at risk of converting to MCI. “If we consider the results of our study and the shortness and ease of administration of verb fluency test, without the need for any other instrument than a stopwatch, we recommend adding verb fluency test in the context of a complete neuropsychological assessment, but not in isolation, in a Memory Clinic Diagnostic Unit,” concludes Dr. Alegret. Full study: Alegret M, Peretó M, Pérez A, Valero S, Espinosa A, Ortega G, Hernández I, Mauleón A, Rosende-Roca M, Vargas L, Rodríguez-Gómez O, Abdelnour C, Berthier ML, Bak TH, Ruiz A, Tárraga L, Boada M (2018) “The Role of Verb Fluency in the Detection of Early Cognitive Impairment in Alzheimer’s Disease”, J Alzheimers Dis 62 (2) 611–619 (doi: 10.3233/JAD-170826).